Ayat al-Akhras, left, and Rachel Levy. 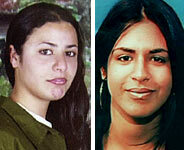 JERUSALEM, April 4  The suicide bomber and her victim look strikingly similar. Two high school seniors in jeans with flowing black hair, the teenage girls walked next to each other up to the entrance of a Jerusalem supermarket last Friday. Ayat al-Akhras, 18, from the Dheisheh refugee camp near Bethlehem, was carrying a bomb. Rachel Levy, 17, from a neighborhood nearby, was carrying her mother's shopping list for a Sabbath eve dinner. The vastly different trajectories of their lives intersected for one deadly moment, mirroring the intimate conflict of their two peoples. At the door of the supermarket, Ms. Akhras detonated the explosives, killing Ms. Levy and a security guard, along with herself. The teenagers' deaths were invoked today by President Bush as he described the horrors of the escalating conflict here. "When an 18-year-old Palestinian girl is induced to blow herself up and in the process kills a 17-year-old Israeli girl, the future itself is dying, the future of the Palestinian people and the future of the Israeli people," Mr. Bush said. The twin images of the girls resonated here, piercing a public consciousness increasingly numbed by more than 18 months of grinding violence. The daughter of a refugee family originally from the Gaza Strip, Ms. Akhras grew up in Dheisheh, a grim warren of alleys and tightly packed dwellings that house 12,000 people on the southern edge of Bethlehem. She was the 7th of 11 children, living in a bare third-story apartment down one of the camp's narrow streets. Despite the violence and turmoil of the past 18 months, Ms. Akhras stuck to a steady routine, her relatives said. Every morning at 7 o'clock, she would leave home for the half-hour walk to school at the neighboring village of Artas. She would return home in the afternoon and devote herself to homework and housework: cooking, ironing, doing the laundry. A top student with superior grades, she was preparing for graduation exams in a few months and planned to study journalism at a West Bank university, said her father, Muhammad Akhras, a construction foreman. "She studied all the time," said a brother, Fathi Akhras. On Sept. 1, 2000, she became engaged to Shadi Abu Laban, a tile layer from Dheisheh. They were to be married in August. Ms. Levy was also preparing for graduation exams. Her specialty in school was photography, and she recently completed a final photo project whose theme was water: pictures of a waterfall, a street puddle, a pond. But her real passion was exercise. Ms. Levy worked out daily at a local club or in the living room, using a Jane Fonda exercise video from 1985 that had originally been brought by her mother. "Fitness was her obsession," said the mother, Avigail Levy. "Her appearance was very important to her. She tended to get stressed out, and the exercise was a release." The second of three children, Ms. Levy was born in Israel but spent the first nine years of her life in California, where her parents lived mostly in Los Angeles before returning home. She was so Americanized that she continued to speak English to her parents even after the family moved back. Her parents later divorced and her older brother moved out, leaving her at home with her mother and a younger brother. As the violence between Israelis and Palestinians built steadily over the past year and a half, Ms. Akhras betrayed no sign of anger or militancy. She heard the worsening news on television and radio, she saw the scars left by Israeli shellings and military incursions, but there were never any indications that she was slipping into despair or plotting an act of revenge, her relatives said. "She was quite normal," said her father. Ms. Levy, for her part, refused to let the increasing Palestinian suicide bombings change her life. She insisted on going downtown with friends, despite her mother's pleas. "She wasn't afraid," her mother said. "It didn't touch her at all." Ms. Levy was more protective of her mother, though, and would often change the channel on the television at home soon after news of another suicide bombing came on the air. Last Friday, Ms. Levy told her mother that she wanted fish for Friday night dinner instead of the usual chicken. Her mother sent her out with a shopping list to a grocery shop downstairs, but some of the items, including the rice crackers Ms. Levy favored over high-calorie matzos on Passover, were only available at the supermarket nearby. Neither mother nor daughter dreamed that the place would prove a deathtrap. At Dheisheh, Ms. Akhras left home as usual for school. Classes were in session that Friday, usually a day off, to make up for time lost during an Israeli incursion a few weeks earlier. After school, friends said, Ms. Akhras said something about running an errand in Jerusalem. As Ms. Levy walked up to the supermarket in the neighborhood of Kiryat Yovel a little before 2 p.m., Ms. Akhras also approached. They walked to the door, where Ms. Akhras was stopped for a check by a security guard. Then, an explosion. Ms. Akhras left behind a farewell videotape. Her head wrapped in a checked Arab headscarf, she announced that she was "a living martyr," ready to die for Palestine. Ms. Levy did not get a chance to say goodbye, but her mother discovered musings in one of her notebooks. "She wrote about love," she said, "and about death. About what comes after death."